There's something magical about spending your vacation in a villa that does beachfront one better, with accommodations that perch directly above the water. Imagine going to bed with the gentle sounds of the sea all around you, then waking up to colorful tropical fish swimming under your feet and seabirds coasting in for a landing on your private deck. It's like treehouse meets beach camp, meets adult luxury, and it's an opportunity that you won't want to miss out on. Once found only in ​South Pacific destinations like Fiji, overwater villas and bungalows have now come to the Caribbean, in destinations as diverse as Jamaica, Bermuda, Belize, and Panama. 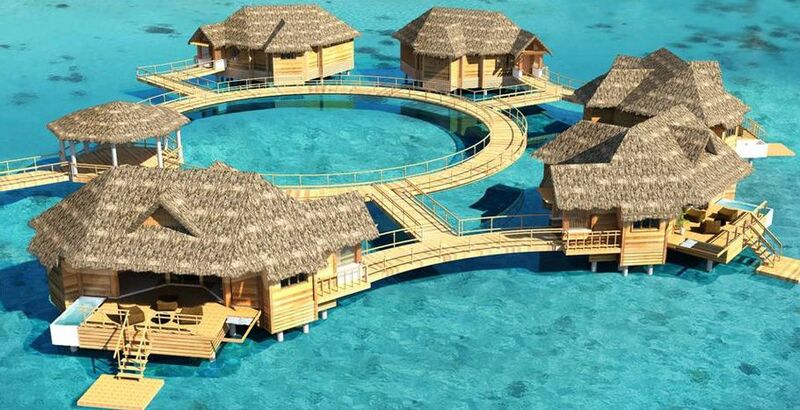 Sandals added five overwater bungalows to the Sandals Royal Caribbean resort in Montego Bay, Jamaica—just offshore from the resort's private island. The 1,600-square-foot overwater bungalows each have an outdoor private infinity pool, Jacuzzi tub, and showers, as well as hammocks dangling over the sea, glass floors, and butler service. These are not the first overwater lodgings in the Caribbean (as some have claimed), but they are some of the most accessible and sought-after. The Cayo Espanto resort in Belize has just one overwater bungalow, but it's a beauty. The Casa Ventanas, like all of the rooms at this private-island resort, features an open, modern layout. Unlike the other rooms, however, the 1,000-square-foot Casa Ventanas sits on a private dock 150 feet off the island. Freeform wooden walls, local antique furnishings, shuttered windows and a plush bed—not to mention an ultra-private deck—make for a romantic and memorable stay. Popular resort activities include snorkeling and scuba and fishing as well as indulging in spa services. Cayo Espanto is located off the island of San Pedro on Belize's Caribbean coast. The Punta Caracol Acqua-Lodge consists of six overwater bungalows strung pearl-like off a rainforest-covered island dotting Panama's Caribbean coast. The bungalows at this small ecolodge are solar-powered and comprised of natural building materials like thatched roofs. Accommodations come in two sizes, but all are two stories high and have decks for enjoying sunsets and watching dolphins; guests also can snorkel the coral reefs right from their bungalow. The Punta Caracol Suite accommodation includes a king sized bed, two twin beds, lounge chairs, and a hammock while the Luna Suites are slightly larger and include a bigger terrace, as well as a solarium with stairs for immediate access to the clear ocean waters below. Located in Panama's Caribbean San Blas Islands, this eco-friendly resort not only has overwater bungalows but also a fine-dining restaurant that hovers just above the waves. Villas are well-appointed with private jacuzzi tubs, hammocks, and private sun decks, and you'll find abundant diving and cultural activities here, including interacting with the local Kuna Indians. Built with an emphasis on natural entertainment and accommodations in mind, the overwater bungalows at Coral Lodge do not come equipped with Internet or television.